First Communion Gifts: Catechism CDs, downloads, and coloring pages. You treasure your First Communion gifts for life; so, when you're giving, it's good to give something special. Your children will treasure their First Communion missals and rosaries their whole lives and so will adults. But what should you give? How do you make a decision which is the best First Communion gift? Try to keep things simple and duplicatable so that you can keep track of the older children's gifts as well as afford gifts for the younger children. Less is often best, leaving fewer heartaches through the years. 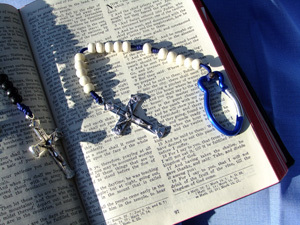 Rosaries, Missals, cards, and keepsakes are the usual gifts for both adults and children. Usually parents or God-parents are the ones who give the bigger gifts because they are more personal, important, and dear. Give less expensive rosaries to children, though, because they are very prone to lose them. Put the name and phone number of the child inside the missal so that it can be returned. Add a special note on the inside cover. Add the year as children refer to this book to remember the special day. Notes are extra special when they are personalized with a lovely note like, "For my dear daughter Mary on her First Communion day - that she may become a saint in every way." The most treasured and traditional Catholic First Communion gifts are those that represent the reason for the day, the first reception of the Holy Eucharist: receiving Jesus. How many of us treasure our First Communion catechism books and First Communion rosaries. Even the cards we receive are extra special when we keep them to remember the people who gave them. It's a good idea to put names and phone numbers on these, too. especially those related to the communicant's Baptismal saint. Statues are great, too, but might be a disappointment to some children if they cannot play with them. Also, a Catholic family is often large, so it can be hard to find space on shelves for many statues through the sacramental years. 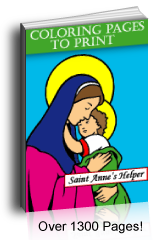 If it is early in the First Communion year, our first recommendation is Saint Anne's Helper First Communion Catechism for its content and great review aids. It is so important to have a good catechism first. 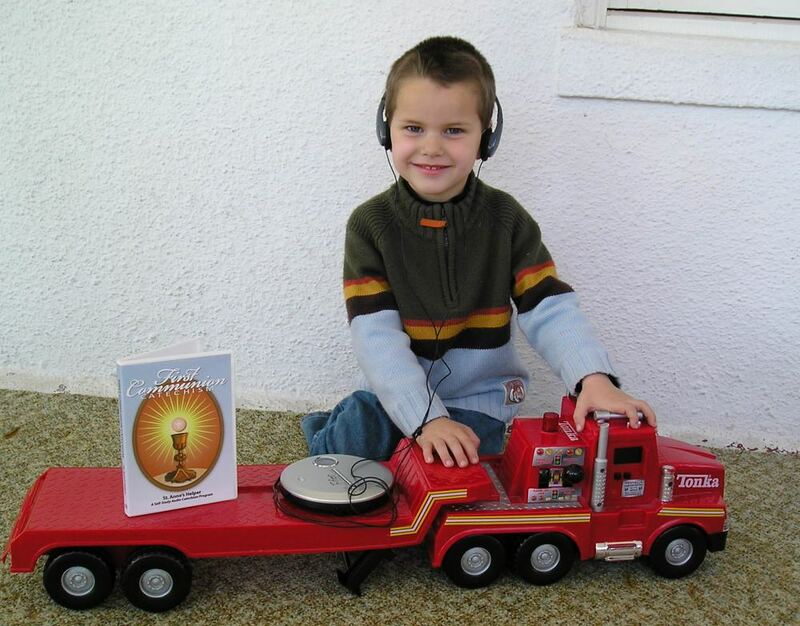 Audio CDs - Audio First Communion CDs make awesome gifts for Grandchildren or God-children so that they can learn the truths in the Baltimore Catechism easily. Many times our children do not have help learning their prayers or the catechism answers so these audio files are very helpful. Audio Downloads - These are the same as the CDs and are easy to buy. You can own them immediately. 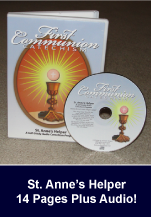 Both the CD and the Download make learning the Catholic Prayers, Catholic Ten Commandments, and first sacraments easy using Audio and Text files. 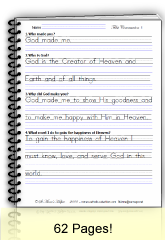 Communion Worksheets - The companion First Communion Catechism Copybook offers copywork worksheets in Manuscript that you can bind or use individually. 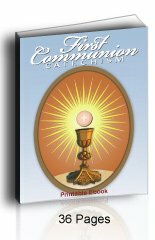 First Communion Catechism Ebook - Printable companion ebook of the same questions and answers for Holy Communion. Audio Baltimore Catechism No. 1 CD - Straight from the 1885 version with no companion products. One of my favorite First Communion gifts was the First Communion Rosaries I received from my parents and even one from the Dominican sisters who ran our school. They usually come in colors that commemorate the event and are appropriate for either boys or girls. They frequently have a center medal with a Host and ciborium depicted, try to choose one that is sturdy since the open medal breaks easily. Children and adults both appreciate receiving an adult sized Rosary that has their favorite color or center medal, but white is often the choice for girls and black for boys. See if you can get the rosary blessed before giving it. Benedictine rosaries are favorites, too, since they carry additional promises when blessed by the Benedictine monks. The Dominican blessing can be given by any priest and is a wonderful thing to do for your family and friends when you are giving First Communion gifts. Since many Communion dresses are not modest it is good to know that many costume patterns make excellent First Holy Communion dress patterns and allow you the flexibility to choose the material you like and to add the decorations you choose, and you can also make her First Communion purse to match! Of course, a hand made First Communion dress is the most thoughtful of First Communion gifts, especially if made by someone dear. The First Holy Communion dress should be modest, simply elegant and comfortable. Remember that the lace can itch and cut! Simple cotton bias tape can cover the back side of any rough lace or elastic even on a store bought dress. Mom did this for me on a darling handmade dress donated by a parishioner. Bridal shops often have a wide selection, too. We used LiliesApparel's Girls Julianna Dress one year in a wonderful white cotton. They had custom options and we used their Battenburg lace and longer sleeves. Send a link to this picture to the left if you want them to make one for you. You may have to request pictures of their options as they have changed their website, yet still have the many options (2017). You can also request a catalog. Be sure to get her First Communion shoes before the Easter dressy shoes are gone for the season. Pretty white shoes can be hard to find after Easter! Her First Communion purse can keep her rosary, missal, and other dear treasures handy on that beautiful day. She's not likely to lose her holy cards if she keeps them in her purse. First Communion veils are easy to make. Again, costume patterns give the measurements and directions with materials suggestions. You can also use any white veil for First Communion Day. As a matter of fact, if your daughter's dress is off white, you might want a veil to match. Consider making your own Irish First Communion dress of Irish linen. Seamstresses are thrilled to help in the selection of satin and Irish linen materials. Many costume patterns make excellent First Holy Communion dress patterns and allow you the flexibility to add the decorations you choose. You can also make a matching First Communion purse in the same material and motif! Tux with bow tie and white shoes. White suits can be easier to find at bridal shops and can be rented like the groom's tux. We found a tux for one of our boys at a second hand shop. Many places like Amazon carry First Communion suits. 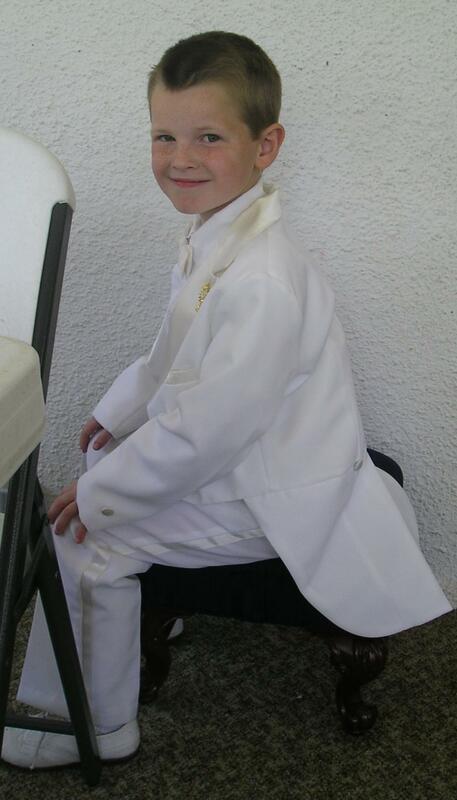 Boys' white First Communion shoes are nice. We know one lady who simply spray-painted a pair of shoes white! They looked great and she received so many compliments! If you cannot find white, black is fine. 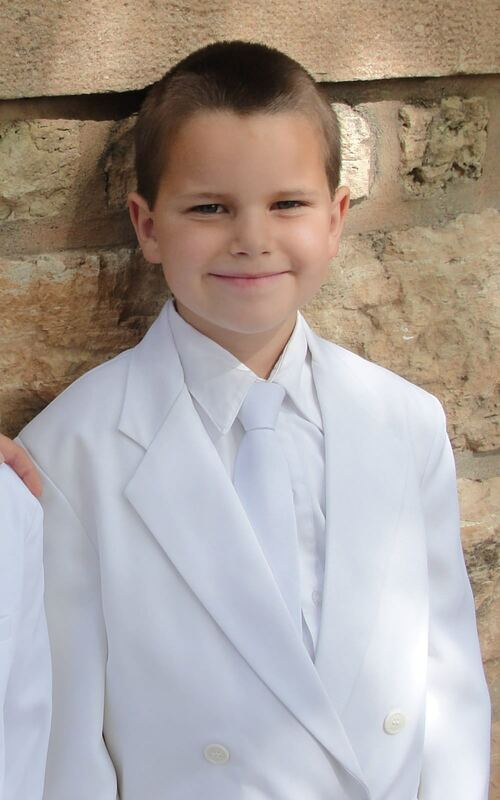 If you're doing all white, you'll want to remember white First Communion ties. Some of the ties are available with Eucharistic designs on the material. White socks are a must if the shoes and pants are white. You can use sports socks if the shoes are big and nylon socks if they are tight. Knee high socks are very nice. Many parishes do not ask for the white apparel and only ask that the boys wear a shirt and tie or sometimes a nice Sunday suit. Old pictures of First Communions seldom show the boys wearing white. This is a helpful suggestion to your parish DRE during tough economic times when it is hard to buy a one time outfit. Do check what your parish does so you're prepared in plenty of time to keep all pressure off the big day. First Communion invitations are not only useful to invite relatives and friends to the Mass and gathering, but can also be treasured mementos to Grandparents and Godparents, other relatives and friends. Be certain to call early in the year to let those who must travel know about the First Communion and its probable date so they can make travel arrangements. It is very nice to tell those who are traveling that you expect no First Communion gifts. Their presence is a most generous gift. Send the invitations about three weeks to a month ahead of time. Many Godparents and Grandparents save these invitations to put in shadow boxes or scrapbooks. Many First Communion invitations are keepsake quality. These First Communion Remembrance cards are the cards that relatives and friends send to the First Communicant. They can be bought at Catholic books and gifts stores or homemade. You can keep a homemade card handy throughout the Communion year for your child to make his or her own record of prayers and sacrifices. and acts of Faith, Hope and Charity as hearts. They love to mark them and these become their most treasured keepsakes over the ensuing years. Little ones can make First Communion gifts of our First Communion coloring pages. Communion jewelry usually has some symbol of the Crucifixion or Catholic saints as Crucifixes or patron saints medals. Find a lovely collection of Communion jewelry here. Usually the parish provides the First Communion Certificate which should be filed for evidence for future sacraments, yet it is also nice to buy another so as to be able to frame it as a keepsake or add it as a title page in a scrapbook. FIRST! Before the party: Plan a time before the party for your First Communion candidate to say the prayers that God hears so well on this most excellent day! After that let a simple gathering mark the day. The First Communion cake is the first element necessary for any First Communion reception. It marks the occasion in a dignified manner and adds to the festivity appropriate to this glorious day. It is easy to make a First Communion Cross cake by removing the outer quadrants of a 9x13 for a small group or by using three 9x13 pans with the two cakes placed laterally on a tray and the one sliced in half for the Cross arms. Small white plastic rosaries can be added to the decorations, too! Consider using Crisco as the base in a butter cream frosting mix if you want that intense white color that is so appropriate for a First Communion cake. Catholic coloring pages to print - Great for teaching and greeting cards. Catholic Coloring Books - Great to wrap as gifts. We hope that you have enjoyed these ideas for First Communion gifts and that you can share them with others!